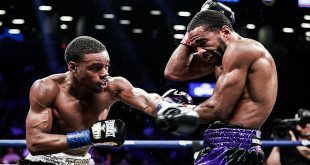 It was another dramatic title defense last night by Ivan Calderon as the WBO light fly ruler kept his title against Jesus Iribe at New York's famed Madison Square Garden. But it wasn't a walk in the park but at least this one went the distance with no cuts forcing technical decisions as had occurred during Calderon's last three defenses. 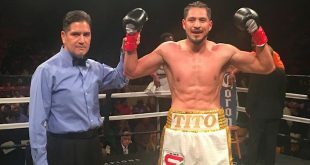 Challenger Iribe of Mexico started out strong, pressing the 35 year old Puerto Rican southpaw champion and striking the target in the second, flooring Calderon. Calderon beat the count and managed to ride out Iribe's follow up assault until round's end. The combatants grappled for control and it wasn't until the fifth frame that the champion was able to gain control of the bout. From that point on it was Calderon who kept the aggressive challenger at the end of the jab and aside from sporadic success from Iribe, the Puerto Rican icon's superior boxing skills were in full flower. 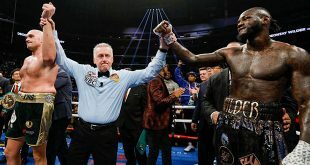 After 12 rounds were completed, Calderon won the cards via a 118-109, 118-109 and 116-111 unanimous decision, remaining undefeated at 34-0-1 (6) and retaining the WBO light fly crown for the sixth time. Despite the spirited effort, Iribe loses his third world title challenge and falls to 16-7-5 (10).